This is just a reset on projects that we are working on or thinking about. To date, every product we have offered, we feel it was best in class through testing several available options or designing a new product with fewer compromises that what is available. For example, we have tested several different dampers on our S2000 including Motons CS and hands down the best damper performance value was the DFVs. That is what we believe in and to date we have sold 41 sets of DFVs and all but 1 customer has been completely satisfied with them. The DFVs were available for 2 years before we sold them and didn’t sell very well. Due to S2KI vendor promotions, price drops and great reviews, there have been over 70 DFVs sold via S2KI vendors in the last 2 years probably making it the highest selling premium suspension. We have gone through at several sets of wheels (Volk, Prodrive, etc) and felt there was always more left on the table from a width point of view so we went through several sets of CCW wheels to confirm the true limits of stock and modified fenders. Today we can consult and offer the maximum width wheels depending on your fender limitations or modifications. When we weren’t satisfied with any available products, we choose to work with a vendor to manufacture a new product with fewer compromises like the Essex Brake kit, Fluidampr Crank Damper or AT Power ITBs. Below are some projects we are working on where we feel we can provide a better option than what is available today, a new product altogether or an evolution of an existing product. We are currently redesigning our ITBs with oval throttles. There was nothing wrong with our round throttles ITBs but our vendor has differentiated themselves on oval throttles for their off-the-shelf kits and is no longer making round throttles for custom ITBs. Oval throttles allows us to keep the same throttle surface area while moving the throttle a little closer to the head, improving response and possibly flow. Also, oval throttles have better control, as airflow is more linear to throttle position angle. We have delivered 2 prototype sets and we need to clean up a few interference issues. Our 3rd set with the revisions is due next month. One thing to note is the size of the throttle is overrated, as AT Power throttles are 1-1.5” away from head. There are 2 other excellent 60-65mm ITBs available for the S2000 and both have the throttles >5.5” away from the head. Our runner diameter is 60mm at that same distance and most likely their ports have a ~50mm port diameter @ 1” from the head. So the size of the throttle really isn’t changing the size of the system. Thus our ITBs have flow tested the same as larger throttles systems (data on our site) with a few other benefits including; our ITBs are more cost effective, offer variable length runners options for different redlines, custom color options, have better throttle modulation and faster throttle response. Overall we feel our system is more drivable with out any loss in power. Additionally, we have been testing custom runner designs that will significantly improve the torque and AFR curves and pick up 5-10+ HP above and standard ITBs. Since our ITBs are modular, all of our sets can be upgraded to the custom runners at any time. We are currently waiting on 3-D printing to lower manufacturing costs and improve under hood fitment for these custom runners. This is something Gernby has completed testing on for us and this would already be available if it wasn’t for the Oval ITB redesign. Gernby has been able to get the DBW actuator control to work with out throwing any codes, MAP tuned on flash pro and daily drives them. Right now the actuator housing, bracket, gearing and drive shaft is looking like a $650 option including 1 hour of tech support from Gernby. We will also offer a remote Flash Pro Tune through Gernby for $150. I still think we are a few months away to get the new prototype actuator for the oval ITBs and test fit. We will be offering the prototype kit at a discount once we are satisfied with fitment. We are on our 3rd unique design hence the “Unicorn” name. We have designed and tested a 4-1 and Tri-Y. We have also tested 2 different sequentially paired headers that were available. The 4-1 simply had power gains and losses at different RPM with about the same area under the curve. The sequentially paired headers lost power compared to OEM. Our 2nd design, the Tri-Y tested well, making power on 2 motors and breaking even on a 3rd, but the cost to sell would have been $1750 and we didn’t feel it would be worth the gains. It was a very high quality header, but we don’t think it would have benefited the community at that price. We have a new, 3rd simpler design that should make consistent gains in theory and will retail for less than our 2nd design cost to manufacture. Prototypes should be in hand this week with dynos coming soon. Gernby’s patented mid-pipe is as effective as it is innovative. We have discussed with Gernby to bring it back into production for the S2000 community adding dual 70mm mufflers for a complete system. We are currently working on bill of materials through the end of the year. We have spent 2 years on cams so far and have had 5 different camshaft manufactures fall through for various reasons. 6th times a charm, as we have found a flexible cam designer that has designed many profiles with low valve jerk at the durations and lifts we wanted. They can provide billet cores on demand out of an alloy that is harder and stronger than 8620. We are having some changes being applied to the first batch of cams. Once we receive back, we will resume cam-timing adjustment testing. 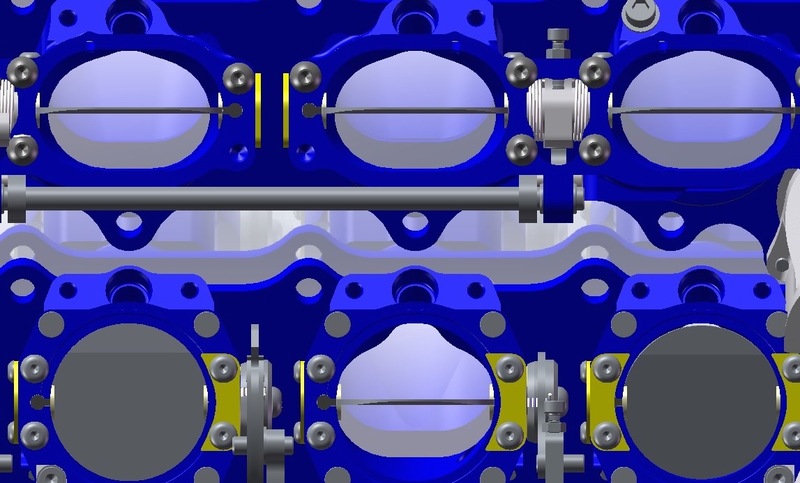 In our opinion, camshaft gains are all about cam timing. We have dyno tested and measured many different cam profiles and timing by far has the biggest affect on gains. This will take a while to get it right so no guarantees on this. One of our vendors has approached us with a design that we want to fund. It will run internally off the stock oil pump chain so no belt break or slippage concerns. 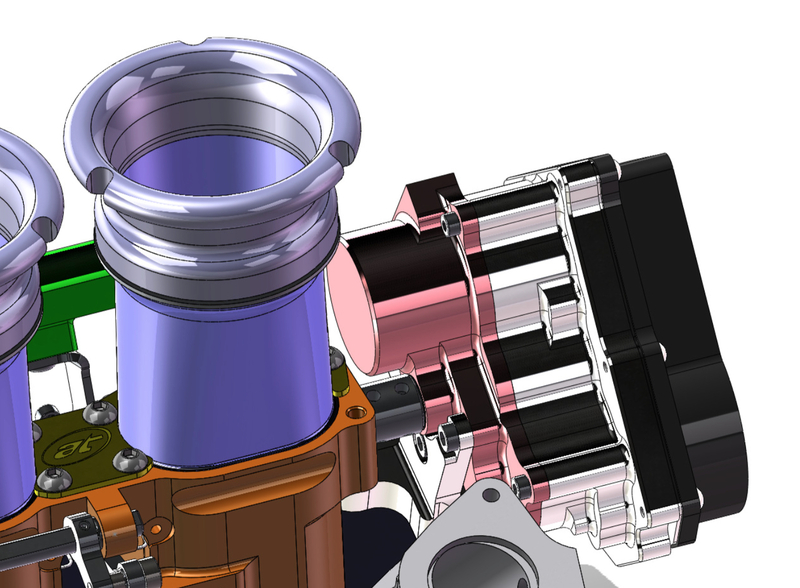 Scavenge lines will be integrated into a billet pan, the oil pump will mount direct to the pan and the oil filter will be integrated into the oil pump. This significantly reduces oil lines, which reduces cost, reduces weight, reduces points of failure and simplifies the install. It wont be cheap, but we hope it will benefit the community. Thank you for reading. We will peak at this thread a few times a week if anyone has any questions. Will your ITBs, cams, and headers be sold as a power pack, like the Hytech system? I'm interested in the cams and header, but not the ITBs at this time. Btw, all this is really exciting. It's not often that an American manufacturer is making truly innovative parts for our cars, mass-producing them, keeping the costs down, and providing excellent support and R&D. I haven't purchased anything from you guys yet (Ohlins DFV will be the first thing, probably in January) but I look forward to doing business with you in the future. More info on this header. I've always leaned towards hytech. What is the collector diameter going to be? Is your header being designed and/or tested to be compatible with the Gernby mid-pipe/exhaust in terms of making combined power gains? An admittedly selfish consideration: trade in/up program for Gernzhaust owners who want the new version with better welds and fitment. Haven't thought of a power pack, but it is a good idea. Could possibly bundle at a small discount and offer a base map. We do intend to keep everything separate so they can purchase as needed. Mr AK has a set of the round throttles. The oval throttle was kinda of forced on us mid/late summer. We are rolling with it because there could be some advantages. Either way you have to work with your vendors to make sure there is mutual benefit. Gernby approached us a while back and we didnt take him up on his offer. We are excited to work with him and bring what we feel is the best exhaust system back to the market. Collector diameter is 2 & 3/8". We don't want to share too much as we think there is some secret sauce. We hope it makes power or it is strike 3 on the header. Yes. Our 2nd header design made gains over OEM with the Gern Pipe and this design should too. We were not involved in the first Gern pipe production so we can't really exchange anything there, but maybe we can work out a discount? Have to think about it. We are licensing Gernby's so we are taking on all costs and not Gernby. Exciting stuff! Glad to see a company taking such interest in our cars, and the aftermarket for them. Looking forward to the Gerby exhuast.